Race around through the diamond mine from Snow White and the Seven Dwarfs on an adventurous family coaster. Embark for family-friendly thrills as you enjoy twisting and turning about throughout Fantasyland village. Showcasing a unique coaster system all its own, Seven Dwarfs Mine Train cruises along into a fabulous mine—swinging and swaying up large lifts, past sharp banks and around exhilarating turns. Be on the lookout for favorite characters from Snow White and the Seven Dwarfs! They’re all here, recreated in vivid detail using innovative technology that brings their 3-dimensional expressions to life. Hop into your mine cart—hewn together with wood, metal bands and nails—and get ready for a wild ride! The excitement starts as you take off and ascend a steep hill. Near the peak, beware the broken track before you, along with 2 ominous vultures perched atop an abandoned jib crane. Hold on tight—this adventure’s only just begun! Feel the wind in your face when your cart teeters over the crest, traveling down and around the mountain and deep into the mine shaft. Soon, the dark begins to glow as you happen upon the Seven Dwarfs hard at work, whistling and singing while collecting glittering diamonds, sparkling emeralds and other precious gems. All your Dwarf friends are accounted for—Sleepy, Happy, Grumpy, Dopey, Sneezy, Bashful and Doc—as you careen through the cavern and climb toward an opening to the outside world. After passing behind a waterfall, peek off into the distance toward a rustic cottage where Snow White and her Dwarf friends are inside celebrating, right as this rocking ride comes to an end! 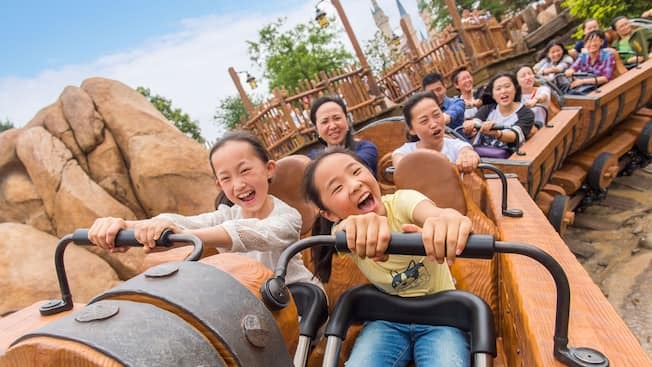 Seven Dwarfs Mine Train is inspired by Walt Disney’s Animated Classic, Snow White and the Seven Dwarfs. As innovative as it was imaginative, Snow White wasn’t just Walt Disney’s first full-length animated feature film; it was the first film of its kind ever made! Released in 1937 in the United States, China and the world abroad, it went on to become one of the most successful cinematic releases of all time, both theatrically and on home video too. In 1955, Disneyland Park in California first opened its gates, and prominently featured the original Disney Princess and her Dwarf friends in the attraction “Snow White and Her Adventures.” Since then, the film has inspired experiences at Disney theme parks all across the planet—a tradition that continues at Shanghai Disneyland to this very day!